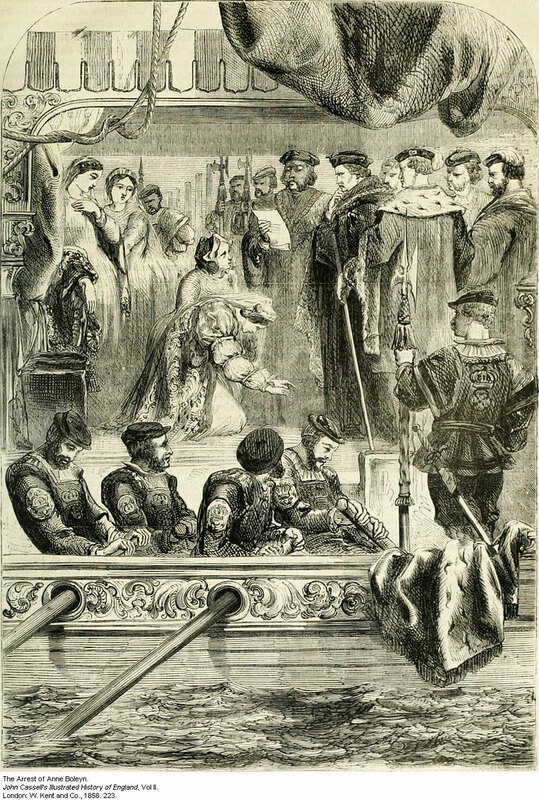 The Arrest of Anne Boleyn, 2 May 1536. Henry had been so well worked upon by Jane Seymour and her friends that he ardently wished to be rid of a woman with whom he was no longer in love, and who could not bear him the son he desired. He had already on several occasions spoken of his marriage with Anne as invalid, and of his intention to proceed with another divorce. He had assured Jane Seymour that his love for her was honourable, and had clearly shown that he intended to marry her. But, as usual, he had not courage to strike the blow with his own hand; he was waiting for someone to take the responsibility of the deed. Of course Cromwell might have helped to obtain a divorce; but he saw that it would be neither in his own nor in the king's interest to proceed in this manner. To have applied for a divorce would have been to proclaim to the world that Henry, on entering the holy bonds of matrimony, was careless whether there were impediments or not; it would have been to raise a very strong suspicion that the scruples of conscience he had pleaded the first time were courtly enough to reappear whenever he wanted to be rid of a wife. Henry's reputation would have greatly suffered, and as he knew this himself, although he chafed at his fetters, he dared not cast them off. A second reason—which more especially affected Cromwell—was that Anne, if she were simply divorced, would still remain Marchioness of Pembroke, with a very considerable fortune, and with some devoted friends. Rochford had gained experience, and showed no little ability, and he, acting with his sister, might form a party which would be most hostile to the secretary. Whether Henry was at once informed that Anne was to be killed is not certain. Probably he was only told by Cromwell that he was menaced by grave dangers, and that it would be necessary to appoint commissioners to hold special sessions at which offenders against him might be tried. On the 24th of April, in accordance with these representations, the king signed a commission by which the Lord Chancellor Audeley, the Dukes of Norfolk and Suffolk, the Earl of Oxford, lord high chamberlain, the Earl of Westmoreland, the Earl of Wiltshire, lord privy seal, the Earl of Sussex, Lord Sandys, chamberlain of the household, Sir Thomas Cromwell, chief secretary, Sir William Fitzwilliam, treasurer, Sir William Paulet, comptroller of the household, and the nine judges or any four or more of them were empowered to make inquiry as to every kind of treason, by whomsoever committed, and to hold a special session to try the offenders.3 That this was virtually a death-warrant for Anne, Henry must have known, or at least suspected; but his conscience remained quiet: the deed would be done by others. The commission was not made public; nor was it communicated to the persons to whom it was addressed. That would have been contrary to all the traditions of the Tudor service. It was kept strictly secret; and only a few chosen instruments were to be employed until the case should be sufficiently prepared. To make out a case against Anne was now the great object of Cromwell, and he began his task with characteristic energy. The tacit understanding between Henry and Cromwell which led to the signing of the commission restored the secretary to his former influence. Cromwell was thus in a position to devote himself to the work of collecting evidence against Anne. The old stories about her antenuptial misconduct would not of course suffice. 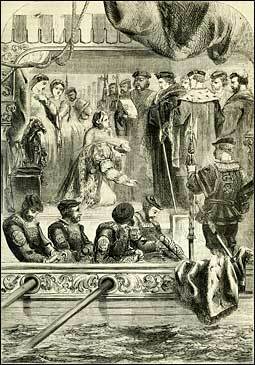 Even with regard to irregularities of which she had been accused after marriage there was a difficulty; for by the statute passed in the autumn of 1534 any statement capable of being interpreted as a slander upon the king's issue might be accounted treason, so that people were rather loath to repeat what they might have heard to Anne's discredit. Cromwell decided, therefore, to have her movements watched closely, in the hope that she might be caught in some imprudence. As most of her servants were secretly her enemies, he did not doubt that some of them would gladly give information against her, if they could do so without risking their own lives. It seems to have been Anne's own imprudence which gave Cromwell his first clue. She was exceedingly vain; and, like her daughter Elizabeth, who inherited many of the qualities of her strange character, she delighted in the admiration of men, and fancied that every man who saw her was fascinated by her charms. Her courtiers soon found out that the surest road to her favour was either to tell her that other men were in love with her, or to pretend that they were in love with her themselves. She was extremely coarse, and lived at a most dissolute court; so that the flattery she asked for was offered in no very modest terms. Lately, her health had been giving way, and her mirror had been reminding her that she was getting rather old and losing her good looks. This caused her to crave more than ever for adulation; and her increased coquetry gave rise to scandalous stories, and provided Cromwell with the kind of charges he wanted. The conversation seems to have been overheard, and to have been reported by Cromwell's spies. Smeton's manner, or that of Anne, had excited suspicion; and when, on the following day, the unhappy musician took his way to London, he was arrested at Stepney and rigorously examined.6 It is not known how much Smeton confessed at this first examination. He may not have admitted that he had committed adultery with Anne; but he was no hero, and fear of the rack or the hope of pardon probably led him to make statements by which she was seriously compromised and by which other persons were implicated. He was kept in close confinement at a house in Stepney, but his arrest and examination were not immediately made known, for Cromwell wanted further evidence before striking the blow. Among the friends of Anne there was a young courtier named Sir Francis Weston, the son of Sir Richard Weston, under-treasurer of the exchequer. He had first been a royal page, but had risen to the rank of groom of the privy chamber, and was now one of the gentlemen of it. For the last eight years, by reason of his office, he had resided constantly at court, and he had obtained a good many grants and pensions. In May, 1530, he had married Anne, the daughter and heiress of Sir Christopher Pykering; and having thus become a man of considerable property, he was created, at the coronation of Anne, a knight of the Bath. Finding all this very interesting, Anne took occasion to speak to Noreys, hoping perhaps that he would gratify her with the same kind of compliments as those which had been paid to her by Weston. She asked him why he did not marry her cousin, to which he replied evasively that he would wait for some time. Displeased by this cautious answer, Anne said he was waiting for dead men's shoes, for if aught came to the king but good, he would look to have her. Noreys, being older and more experienced than Weston, understood how dangerous a game he was being made to play. He strongly protested that he dared not lift his eyes so high; if he had any such thoughts, he would his head were cut off. Anne then taunted him with what Weston had told her. She could undo him if she would, she said. About this they seem to have had some words, Noreys being evidently afraid that he might be drawn into a perilous position. Perhaps Anne herself began to feel uneasy, for she ended the conversation by asking Noreys to contradict any rumours against her honour. This he consented to do, and on Sunday, the last day of April, he told Anne's almoner that he would swear for the queen that she was a good woman.8 Cromwell apparently heard of this conversation, and concluded that the time had almost come for making the case public. Henry was informed of what was about to be done, that he might be ready to play his part. The following day being May Day, a tournament was held at Greenwich, Henry Noreys and Lord Rochford being among the challengers. The king and Anne were present, and seemed to be still on tolerable terms. 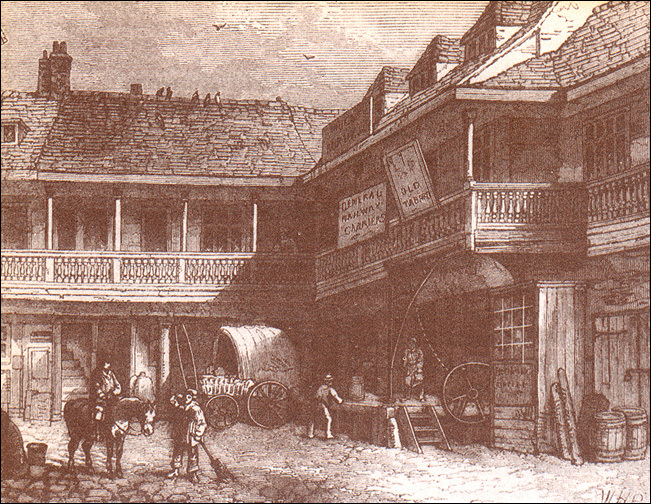 When the tilting was over, Henry bade Anne farewell, and, as had lately become his custom, rode off towards London. On the way he called Noreys to his side, and telling him he was suspected of having committed adultery with the queen, urged him to make full confession. Although the king held out hopes of pardon, Noreys refused to say anything against Anne, and protested that his relations with her had been perfectly innocent. Henry then rode away, and Noreys was immediately arrested, and kept, like Smeton, a close prisoner.9 He was taken to the Tower by Sir William Fitzwilliam, who, it was afterwards asserted, tried hard to persuade him to confess that he was guilty. Whether, as was further stated, Noreys said anything that compromised Anne is not known, but he certainly did not confess that he had committed adultery with her.10 Having left him at the Tower—to which Smeton had been brought about the same time—Sir William Fitzwilliam went to Greenwich, where the commissioners were to examine Anne herself. She was absolutely without means of defence. Henry had gone to to be out of the way, and she could not bring her personal influence to bear on him. The few friends she had were equally out of reach, most of them having gone with the king to London; so she could do nothing but await her doom. Even flight was impossible, for had she been able to leave the palace and to go on board a ship—to elude the vigilance of the searchers and to cross the sea—she would not have been safe. Neither Charles nor Francis would have afforded her an asylum; her flight would have been taken as a clear proof of guilt, and she would have been given up in accordance with the treaties which forbade the various sovereigns to shelter one another's traitors. 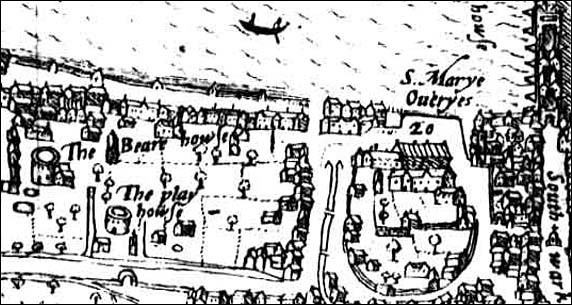 At the end of the interrogatories, the royal commissioners ordered Anne to be arrested, and she was kept in her apartment until the tide would serve to take her to the Tower. 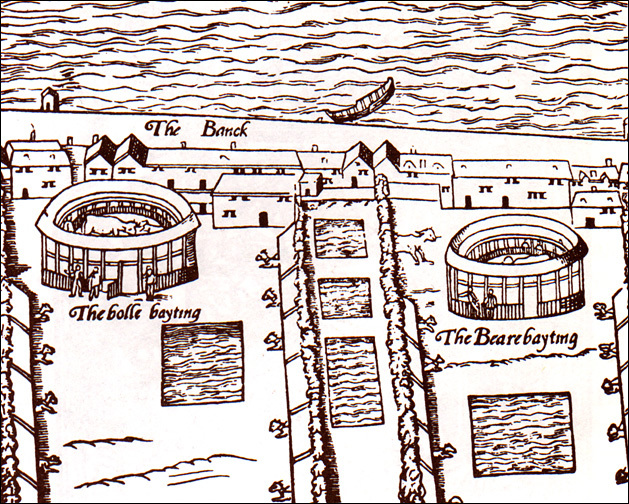 At two o'clock her barge was in readiness, and in broad daylight, exposed to the gaze of the populace who had assembled on the banks or in boats and barges, she was carried along the river to the traitors' gate.14 She was accompanied by the Duke of Norfolk, Lord Oxford, and Lord Sandys, with a detachment of the guard. Lord Rochford had already been caught in the toils which had been woven for Anne's destruction. He was an able and energetic man, strongly attached to his sister; and it was foreseen that in so dreadful an emergency he would, if left at large, do everything in his power to save her. 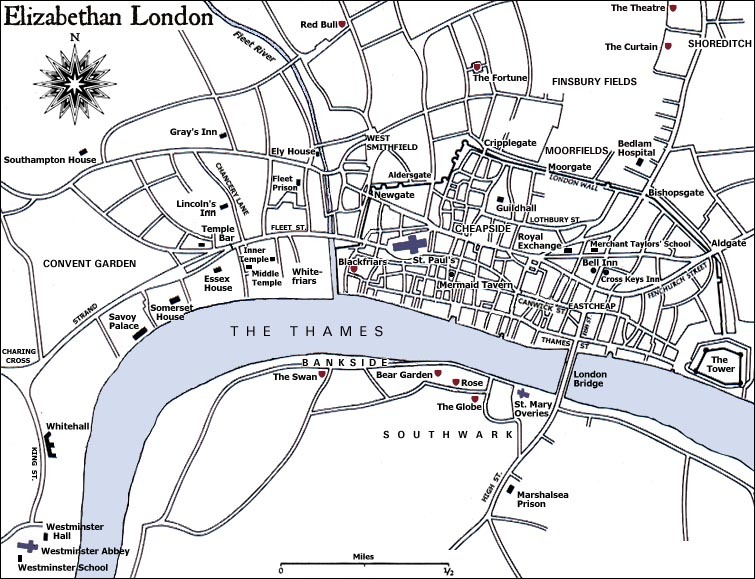 So he was arrested towards noon at Westminster, and taken to the Tower.15 Anne's friends were closely watched, but it was not thought necessary to interfere with the liberty of Lord Wiltshire. He was a mean egotist and coward, and from motives of prudence had always disapproved of his daughter's bold and violent courses. There was, therefore, no reason to fear that he would try to defend her. At the Tower Anne was received by Sir William Kingston, the constable, of whom Chapuis had reported that he was wholly devoted to Catherine and Mary. To his keeping she was handed over by the commissioners. Up to this moment she seems to have maintained an appearance of firmness; but when the gates had shut behind the departing councillors, when she found herself surrounded by the gloomy walls of the Tower, in the custody of the constable, her courage gave way. She realised the full horror of her situation, and as Kingston beckoned to her to proceed, fearful visions of loathsome prison cells rose before her mind. She tremblingly asked Kingston whether he was leading her to a dungeon. He reassured her, saying that she was to go to the lodging she had occupied before her coronation. This somewhat relieved her distress. "It is too good for me," she exclaimed. But, the tension of the last hour having been too much for her shattered nerves, she fell on her knees and burst into hysterical fits of laughter and weeping. The fate which had overtaken Anne excited little sympathy. Even among the Protestants, who formed at this time in England but a small class, there were some who disliked her. The great majority of the people, detesting the changes of recent years, accused her and her family of having plunged England into danger, strife, and misery in order to satisfy their own ambition and greed. The difficulties abroad and the consequent slackness of trade, the severity of the new laws and the rigour with which they were enforced, were held to be due altogether to Anne's ascendancy; and it was expected that with her downfall there would be a total change of policy, which would place England once more in a secure and prosperous condition. But there was a man whom the tidings filled with dismay. For some months Cranmer had been ill at ease. 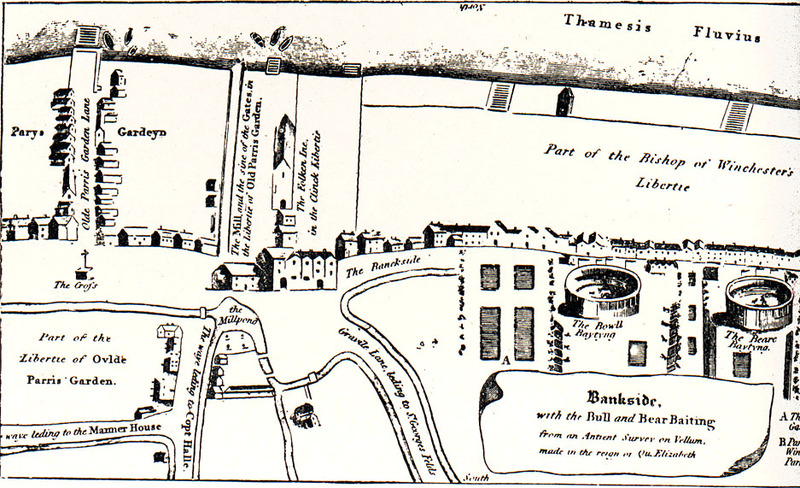 The ultra reformers, Anne's friends, had not been favoured since her influence had begun to decay; and the archbishop, who relied chiefly on them, had found himself under a cloud.18 In the country he received a letter from Cromwell, informing him of the arrest of Anne and of the reasons for it, and ordering him to proceed to Lambeth, there to await the king's pleasure, but not to present himself at court. He obeyed with a heavy heart, for such an order from the secretary boded no good, and Cranmer was not the man to face danger calmly. Next morning, at Lambeth, he indited a letter to the king, beseeching him not to visit the faults which might be found in the queen on the Church she had helped to build up. 1. E. Chapuis to Charles V., April 29, 1536, Vienna Archives, P.C. 230, i. fol. 78: "Le frere de monsieur de Montaguz me dit hier en disnant que avant hier que levesque de Londres avoit este interrogue si ce Roy pourroit habandonner la dicte concubyne et quil nen avoit point voulu dire son adviz ne le diroit a personne du monde que au seul Roy et que avant de ce faire yl vouldroit bien espier la fantaisie dudict Roy vuillant innuyr que le dict Roy pourroit laisser la dicte concubyne toutteffois connaissant linconstance et mutabilite de ce Roy il ne se vouldroit mectre en dangier de la dite concubyne. Ledict evesque a este la principale cause et instrument du premier divorce dont de bon cueur il sen repent et de meilleur vouldroit poursuivre cestuy mesme a cause que la dicte concubyne et toute sa race sont si habominablement lutheriens." 2. E. Chapuis to Charles V., June 6, 1536, Vienna Archives, P.C. 230, i. fol. 92: "Et que sur le deplesir et courroux quil avoit eu sur la responce que le Roy son maistre mavoit donne le tiers jours de pasques il se meist a fantaisie et conspira le dict affaire . . ."
3. R.O. Baga de Segretis, Pouch VIII. Membranes 10 and 14. 4. E. Chapuis to Charles V., April 29, 1536, loc. cit. : "Le grand escuyer maistre Caro eust le jour Sainct George lordre de la jarettiere et fust subroge au lieu vacant par la mort de monsieur de Burgain, qua este ung grand crevecueur pour le seigneur de Rocheffort que le poursuyvoit mais encoires plus que la concubyne que na eust le credit le faire donner a son dict frere, et ne tiendra audict escuyer que la dicte concubyne quelque cousine quelle luy soit ne soit desarconnee et ne cesse de conseiller maistresse Semel avec autres conspirateurs pour luy faire une venue et ny a point quatre jours que luy et certains de la chambre ont mande dire a la princesse quelle feit bonne chiere et que briefvement sa contrepartie mectroit de leau au vin car ce Roy estoit desia tres tant tanne et ennuye de la concubyne qui nestoit possible de plus." 5. Sir William Kingston to Cromwell, Cotton MSS., Otho C. x. fols. 224-26, printed in Singer's edition of Cavendish's Life of Wolsey, p. 456. 6. Constantyne's Memorial to Cromwell, Archæologia, vol. xxiii. pp. 63-65; and Cronica del Rey Enrico otavo de Ingalaterra. 7. Sir W. Kingston to Cromwell, May 3, 1536, British Museum, Cotton MSS., Otho C. x fol. 225, printed by Singer, p. 451. 8. 2 Sir W. Kingston to Cromwell, May 3, 1536, loc. cit. 9 Constantyne to Cromwell, Archæologia, vol. xxiii. pp. 63-65; and Histoire de Anne de Boullant, etc. 10. Sir E. Baynton to Sir W. Fitzwilliam, British Museum, Cotton MSS., Otho C. x. fol. 209b. 11. 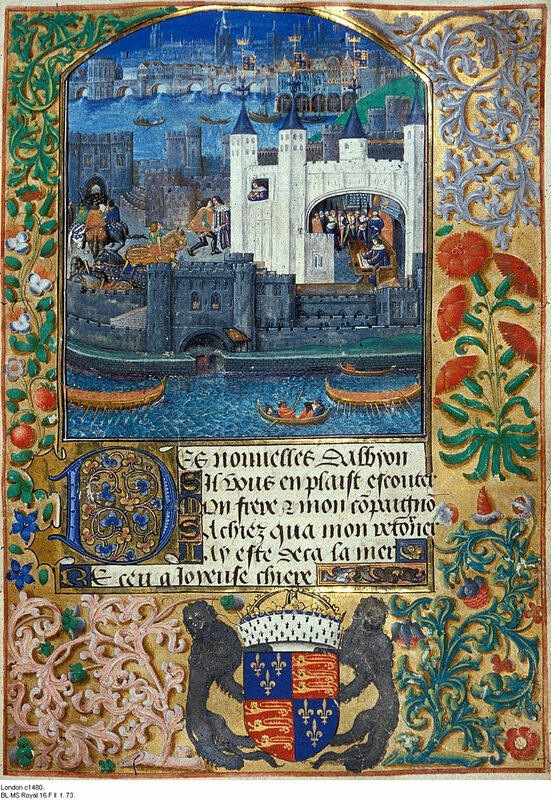 Sir W. Kingston to Cromwell, British Museum, Cotton MSS., Otho C. x. fol. 224b. 12.  Sir William Kingston to Cromwell, May 3, 1536, loc. cit. 13. Sir William Kingston to Cromwell, Cotton MSS., Otho C. x. fol. 224b. 14. E. Chapuis to Charles V., May 2, 1536, Vienna Archives, P.C. 230, i. fol. 80: "Laffaire . . . est venue beaulcop mieulx quasy que personne peust penser et a la plus grande ignominie de la dicte concubyne laquelle par jugement et pugnicion de dieu a ete amenee de plein jour dois Grynuych a la tour de ceste ville de Londres ou elle a este conduicte par le duc de Norphoch, les deux chambellan du Royaulme et de la chambre et luy a lon laisse tant seullement quatre femmes . . ."; Histoire de Anne de Boullant; Wriothesley's Chronicle of the Tudors, etc. 15. E. Chapuis to Charles V., May 2, 1536, loc. cit. : "Le frere de la dicte concubyne nomme Rocheffort a este aussy mis en la dicte tour mais plus de six heures apres les aultres et trois ou quatre heures avant sa dicte seur . . ."; Wriothesley's Chronicle; and Cromwell to Gardiner and Wallop, May 14, 1536, British Museum, Add. MSS. 25,144, fol. 160. 16. Kingston to Cromwell, May 3, 1536, loc. cit..
17. Roland Buckley to Sir Richard Buckley, May 2, 1536, R.O., Henry VIII., 28th, Bundle II. : "Sir ye shall untherstande that the queene is in the towere, the ierles of Wyltshyre her father my lorde Rocheforde her brother, maister norres on of the king previe chamber, on maister Markes on of the kings preyve chamber, wyth divers others soundry ladys. The causse of there committing there is of certen hie treson comytyde conscernyng there prynce, that is to saye that maister norres shuld have a doe wyth the queyne and Marke and the other acsesari to the sayme . . ."; and E. Chapuis to Charles V., May 2, 1536, loc. cit. : "Le bruyt est que cest pour adultere auquel elle a longuement continue avec ung joueur despinette de sa chambre lequel a este dois ce matin mis en ladicte tour, et maistre Norris le plus prive et familier sommeiller de corps de ce Roy pour non avoir revele les affaires . . ."
18.  Cranmer to Cromwell, April 22, 1536, R.O., Cranmer Letters, No. 45. 19. Cranmer to Henry VIII., May 3, 1536, British Museum, Cotton MSS., Otho C. x. fol. 225, printed by Burnet, etc. London: Macmillan and Co., 1884. 239-257. Ives, Eric. The Life and Death of Anne Boleyn. Starkey, David. Six Wives: The Queens of Henry VIII. Warnicke, Retha M. The Rise and Fall of Anne Boleyn. Cambridge: Cambridge University Press, 1991. Weir, Alison. The Lady in the Tower: The Fall of Anne Boleyn. Weir, Alison. The Six Wives of Henry VIII. Site ©1996-2012 Anniina Jokinen. All rights reserved. This page was created on May 2, 2012.